You're House Slytherin. That means you're going places. You're going to graduate from Hogwarts at the top of your class. You could be the greatest Auror in the wizarding world. You could work for the Ministry of Magic. Why, you could even become Headmaster at Hogwarts! When you're in Slytherin, the world is your oyster! Of course, you need to let the world know about your ambition by wearing your House colors. Start with this pair of subtle socks, officially licensed from the Harry Potter movies. 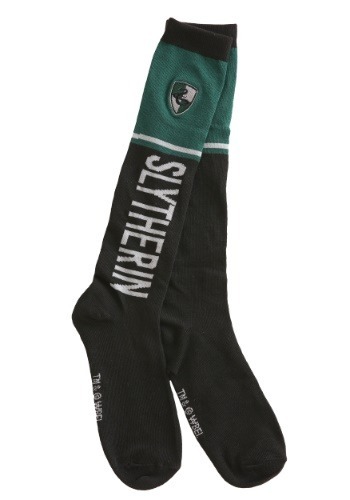 These women's Harry Potter knee-high socks help you show off your Slytherin pride in style! They're made of a spandex blend material that stretches to fit. They feature the green colors of the Hogwarts House and they even have the House sigil on the time. Just slip them on and you'll be ready to represent! If you're looking to craft the perfect Harry Potter cosplay experience, then you need to get all of the details down! That means getting the look down from head to toe. These Slytherin socks definitely will have your feet decked out in the best socks the wizarding world has to offer!